I am not, Your Holiness, a believer in all what religions put forward. But I believe they preserved the human race by sanctifying human life, which is imprinted with the very image of its Creator. In my view, the obligation to preserve human life is the greatest of the Divine messages. Without it, we wouldn’t have witnessed today’s humankind, or lived its inventiveness and achievements. We wouldn’t have formed entities replete with flaws and shortcomings. I am, Your Holiness, Syrian, Arab and Christian. I am a citizen in a region that managed, throughout its long and tortuous history, to fuse its human, religious, cultural and political components. Your Holiness is also aware that the message of Islam -- the region’s last religion -- recognizes and reveres its two preceding monotheistic faiths, Judaism and Christianity. Suffice to read Your Holiness what the Quran says of Jesus (Issa) --“And we gave Issa, the son of Mary, clear arguments and strengthened him with the Holy Spirit” [Chapter Two, Verse 87] – or Mary -- “And when the Angels said: O Mary! Allah hath chosen thee, and made thee pure, and hath preferred thee above (all) the women of creation.” [Chapter Three, Verse 42]. Your Holiness would surely note the difference between these wordings and all that was penned about Jesus and Mary over time. Lastly, Your Holiness is aware that Christianity survived in this Levant, its cradle for over 2000 years. It did so alongside other religions and spiritual persuasions, the most important of which is Islam. And Islam is imbued with some things Christian. Muslims are akin to Christians in some aspects of their tolerant religion. Otherwise, they would not have respected our presence in their midst, even though their religion prescribes Da’wa or Islamic missionary activity. But they always believe in God’s mercy, which commits them to be merciful towards God’s creation. True, this has not always been the case. Equally true, this has mostly been the case in the largest part of history. Otherwise, how would one explain the continued presence of Christianity in the Levant after the Crusades, which the Muslims called the wars of the Franks simply to avoid defaming the Cross? And who protected Christianity and Christians after the Franks were routed by Muslim armies that co-opted Christian fighters? I tell Your Holiness in all frankness that the mutual sense of belonging is what protected both sides. The Christian fighter was referring to the powerful commander of the large Persian force confronting the Muslim army. Today, innumerable attempts are being made to sever this historic partnership. The attempts are mounted by an assortment of Christian and Muslim sides as well as by hardliners and fanatic institutions and organizations that have espoused confessional views. On the Muslim side, such views are formulated in the most retarded and intransigent parts of the Islamic world. They don’t challenge Christianity only, but primarily nonradical Islam. In the Christian corner, there are extremist Churches that perceive the Muslim as an enemy with whom they have been forced to live. They don’t see him as a partner or kindred who shares the belief in God and His mercy. There are clergymen who consider themselves combatants engaged in a belated battle that should have been settled a long time ago. Today, these churchmen are the chief stokers of the fire engulfing the two sides’ believers. The fire they are stoking is no different than the fire stoked by foolhardy Muslims. The problem is that these clerics are turning their back on Your Holiness, perhaps without you knowing. They are waging their battle under banners they claim are your own. They say you share their views and you are part of a world hostile to Arabs and Muslims. They advocate a ravaging confessional war that has had no place in our Levantine history. They wish for an armed conflict to mirror the inter-Christian wars that once broke out in Europe. They see themselves as fighting on Europe’s side and on the side of Your Holiness and what you represent. You have, Your Holiness, to restrain them and put them in their place with unequivocal language. You have to bring them back to their senses, reminding them there is no, -- and will not be -- a Christian-Muslim war. They have to be told that Christianity does not back any war on anyone, especially not the war the Syrian regime is waging on its people in the name of fighting terrorists. It is an open secret that the regime has always embraced, nurtured and trained terrorists before making common cause with them inside Syria and elsewhere on Arab and Muslim territory. The Quran orders: “And slay not the life which Allah hath forbidden” [Chapter 17, Verse 33]. The Syrian regime’s warplanes are not killing the enemies of Jesus Christ. They are bombing peaceful cities and villages without possibly distinguishing between a terrorist and a child or woman or elderly or youth. This means hundreds of unarmed and innocent civilians are probably killed for every insurgent who took up arms in self-defense against the regime’s oppression and blind violence. The Syrian regime is not fighting a battle in defense of Christianity to earn the sympathy of Christian Churches and clerics. It is fighting to defend its tyranny, benefits and oppressive and abusive policies while claiming to be secular. In fact, the regime’s only religion is a cult of personality. The regime is not fighting a battle to defend Christians either. Christians are under no risk except from the foolishness of some of its Churches and clerics. Such foolishness got them to the stage of blessing and celebrating the killing of children, women and elderly people in the false belief that they are party to a salvation war against terrorism and extremism. They don’t see regime violence as being either terrorist or extremist. It’s also as though a genocidal regime’s victory justifies sacrificing the life of a single human being. How could such Churches claim to be faithful to Jesus of Nazareth, the greatest opponent of violence in human history? Return the Church to its senses, Your Holiness. Remind the Church that what kept Christianity in the Levant after the Franks’ wars was the stand Christians took in support of justice. Together with their Muslim cousins, Levantine Christians faced up to submission. They cannot today tolerate regimes that are incapable of ruling people seeking freedom and democracy without using artillery, tanks and warplanes to suppress them. The Levant’s Christianity is in great danger, Your Holiness, not because it is threatened by Muslim fundamentalism, but because it is manipulated by Christian fundamentalists and a mentality adopted and practiced by some Christian churchmen. Their inhuman and immoral policies and stances are a betrayal of Jesus of Nazareth. 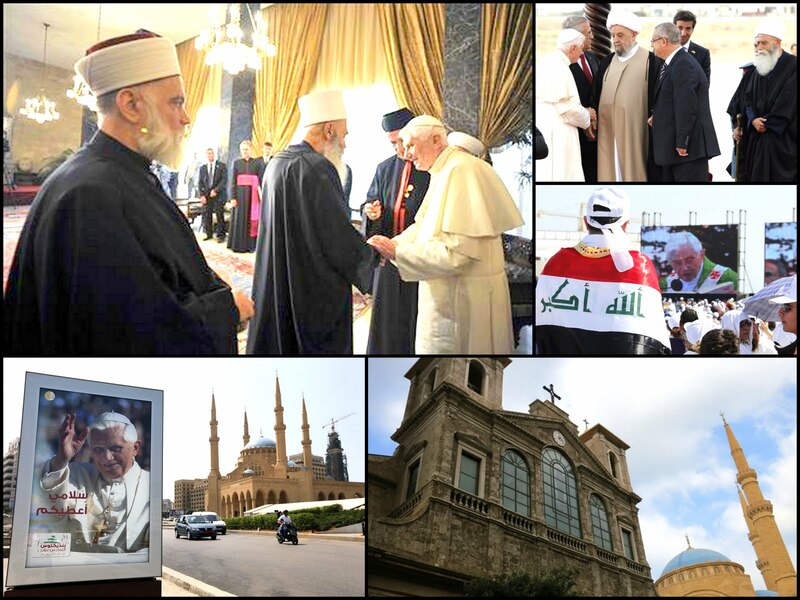 The visit of Your Holiness could mark a turning point in the history of Christianity and Islam. Don’t participate or approve of the temples’ demolition over the heads of Arab Christians. Stretch out your blessed hand to spare Arab Christians the follies of their Churches and clerics.